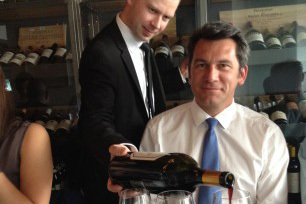 On Thursday 12th June, Nicolas Glumineau hosted a trade lunch at L’Etranger in Kensington. The new General Manager at Pichon Longueville Comtesse de Lalande, in charge also for Château de Pez and Haut Beauséjour welcomed a selection of key figures from the on- and off-trade in and around London. The lunch showcased a range of wines from the three properties, offering guests the opportunity to see the evolution of the wines with time, as well as a chance to discuss what the future holds for each. Glumineau, who has been in the role since November 2012, explained to assembled diners that he has a arrived at a time of “permanent renewal” in the vineyards which has been ongoing since Roederer bought the 89 ha Pauillac estate in 2006. Some of these changes include the production of a “geological map” of the plots allowing a highly detailed approach to planting and care, ensuring the best possible vines in optimum position. Other changes include a mix of 50, 70, 85, 120 and 150 hl tanks installed in the new vat room to enable individual plot vinification. Change, Glumineau explained, was also afoot in the St- Estèphe Roederer-owned properties as well, with both Château de Pez and Haut Beauséjou undergoing a vineyard restructuring. The lunch opened with a tasting of the Haut Beauséjour 2011 and Château de Pez 2009, demonstrating the black fruit focus of these two St-Estèphes, with limited use of new oak barrels to control the level of tannins in the wine. The lunch saw Charolais beef tartar matched with Chateau de Pez 2008 offering an insightful contrast with the 2009 from the initial tasting, followed by pork fillet & glazed belly accompanied by Réserve de la Comtesse 2010 and Pichon Lalande 2008. The Pauillacs beautifully dermonstrated the a[ppelations focus on red fruit, in contrast with the darker berries characteristic of St Estèphe, both marrying perfectly with the pork. The lunch was rounded off with a magnum of Pichon Lalande to match the cheese selection.